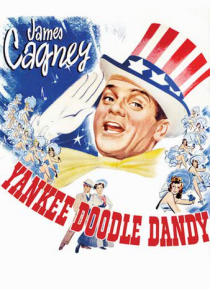 James Cagney ("White Heat," "Angels With Dirty Faces") stars in this portrayal of vaudeville composer and performer George M. Cohan in this biography. Contains some of Cohan's finest songs, including, "Yankee Doodle Dandy," "Over There," and "Give My Regards to Broadway". A "must-see" American classic, Leonard Maltin awards it four stars. Inducted into the Library of Congress National Film Registr… y.